Former UFC bantamweight champion Holly Holm has put on a storied career in the sport of mixed martial arts. The fighter shocked the world when she knocked out UFC superstar Ronda Rousey back in 2015. However, some fight fans have begun to notice that Holm’s form has somewhat changed over the years. The United States Anti-Doping Program (USADA) was adopted as the UFC’s anti-doping watch dog back in 2015, offering a more detailed and thorough drug testing practice for the promotion’s competitors. While Holly Holm has never failed a drug test, the fighter’s physique appears to have somewhat altered through the years. Near the inception of USADA’s implementation in the Ultimate Fighting Championship (UFC), Holm earned her knockout victory over Ronda Rousey for the bantamweight title. 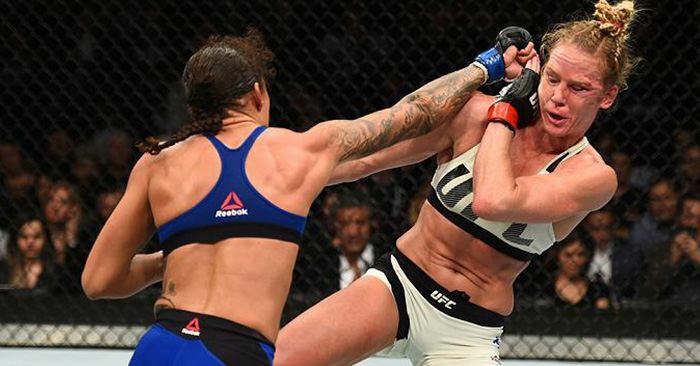 Holm can be seen taking a punch from Rousey in the left image below. On the right, Holm can be seen facing off against Miesha Tate in their battle from 2016. Holm would go on to lose to Tate by way of submission.